It was another pretty low-key day for Clara and we are so thankful! Weekends on the PICU seem a little slower than during the week - not quite as many folks rounding and not quite as many decisions being made. I think the timing for Clara's surgery was great because a weekend of rest and recovery is just what she needs. She looked much, much better today than yesterday. Her swelling has started to go down some although we still need to diuresis her some more in the next 24 hours or so. Her color was looking better and her incision is remarkably already starting to heal. Even though she's still on a lot of morphine and versed for pain management and sedation she looked very comfortable today. She had a couple bouts of hiccups today which I was certainly accustomed to when she was in my belly. They let her hiccup some, but when they wouldn't stop this afternoon they did give her a bolus of some more sedation. We don't want her messing up that shiny new diaphragm. We could start Lasix (the diuretic) tomorrow to try to pull off some more fluids, although we're going to go easy with it since she got a little too dry on Lasix before her surgery. There is also some talk about beginning to back off of her oxygen/ventilator in the next couple of days and see how she handles a bit more of the work on her own. These are all important steps to try to get her "back to square one" as the doctors have said. She has had the expected setbacks after surgery and we need to resolve those issues and get her back to where she was before surgery so that we can begin to think about weaning off of ECMO - the next big step. The heart arrhythmia on Thursday afternoon was a bigger scare than I think we initially realized. Fortunately, they all seem to think that it was physiologically related to the placement of the ECMO catheter and that it has been resolved. We continue to pray for no more heart issues. So that's the medical stuff, but I know what you're really wondering is how is she doing, how are we doing, what did we do today. Well, the answers are: good, good, and we sang, read, chatted and held hands. It was a wonderful Saturday of time with family and time with Clara. Big Daddy went and visited her first thing this morning and then Robert, Mama K, Sweet Mama and I were all there this afternoon. We spent quite awhile singing to her from the hymnbook and eliciting quite an audience of onlookers from the rest of the unit. Clara is blessed to have two grandmothers with beautiful voices. We've got to get these lungs better so that she can join them in song. I'll post some videos of us singing together. We also read a few stories and just spent time touching her, talking to her and telling her about how much we love her and want for her to get well. She seems to really respond to our voices, touch and other stimulation and it makes us really feel like our time spent with her is not just for our benefit, but for hers as well. Daddy Bob just got back in town from GA and I think he's headed over there tonight to give her his love too. Thanks to the many of you who have expressed your concern about me and how I'm doing post-delivery. I have to say I've been very blessed to have an easy recovery and am feeling great. I think my body hated every minute of pregnancy so much that it's just instantly relieved to have Clara OUT! It's been so great to not be nauseous for the first time in nine months, to actually have an appetite, to be able to bend over and move, to not be swollen, etc. etc. etc. I'm doing my best to not push it too hard by limiting my hours at the hospital (as difficult as it is to leave her each day, the nurses are taking good care of her and 4-5 hours there is enough), eating well and drinking lots (thanks in large part to the wonderful help of my fabulous mother-in-law this week), and sleeping when I can between pumping. I'm tired at night, but overall I am feeling good. So, thanks for all your love! Things to continue praying for: fluid reduction over the next few days, a good response to decreased ventilation/oxygen, a strong heart with no more arrhythmia, reduced pulmonary hypertension, successful weaning off of ECMO in the next few weeks, her left lung to grow grow grow, her doctors, nurses and other staff caring for her. And keep praising God for His faithfulness to us and thanking him for loving Clara even more than we do! Here are some photos from today.... even though she's still puffy, she does look so much better than yesterday. When I got ready to leave today and leaned over to kiss her on her forehead, she fluttered her eyes at me and squeezed my finger tightly. I'm pretty sure she was saying, "I love you, Mama." I love you, too, Baby Girl. So much. Our girl has quite a grip. Hang on tight, Clara. We're gonna get you better. These lyrics are especially appropriate for Clara. I think we'll sing it to her every day. We were reminded by a staff member today that having a baby on ECMO means we have one of the sickest patients in the whole hospital. We want to continue to communicate to you how serious this is and how much prayer we still need while also conveying that we are relying on faith and hope and have been filled with God's peace. It's a tough balance. So, keep praying. And we'll keep believing. These glimpses are always so moving. This baby is so lucky to have been born into exactly the right family. I continue to be amazed by your whole family's faith, strength, and love! I'll be singing "Breathe on..." when I pray for Clara from now on. Just wanted to say that friends of Hugh and Liz's from Chicago are following your story and sending love your way! God bless your little Clara and her mama and daddy. Thank you for sharing. We are keeping you in our thoughts and prayers. Clara's daily progress is part of our discussions each night at dinner. Watching these makes me think how much love surrounds Clara...and how it extends to all in the PICU! Most Loving God, fill Clara's lungs with Your breath so that she may join in with her grandmas to praise your holy name. Amen. Praying for Clara. I asked my family (who lives in Mexico) to pray for her too!! Clara is going international!! 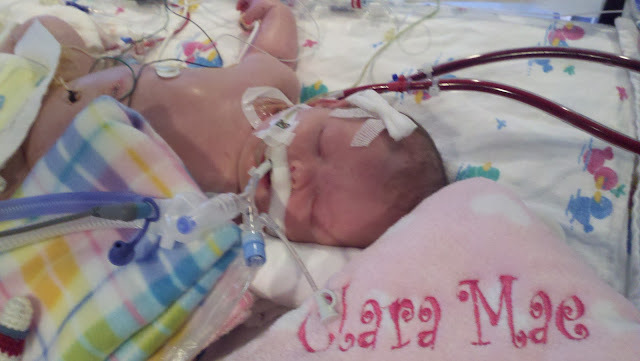 Hopefully, they can arrange a service in my family's church down there dedicated to Clara and her healing. Keep being the strong family y'all are! God bless. the love that you have for this sweet baby just flows right out of your posts. Praying for a "boring" night for Clara! Clara is one blessed little girl to have born into a family who loves the Lord and loves her so much! The pictures of her little fingers around her Irish bunny are precious! We are continuing our prayers! Praying for Clara and your family. Wishing you many more low key days! Your family's faith is a blessing to us all! Thank you for letting us be a part of this journey! We will Continue to pray for you all daily. What an inspiration ALL of you are to all of us. I just KNOW that GOD has only wonderful things in store for you. Keep on believing and you can be sure we will all keep on praying! Get stronger today, sweet Clara Mae ... so-ooooo many love you. Our prayers and thoughts are with you. I could not agree more with the comment above than Miss Clara picked the right family; very proud of you all and we are honored to add our prayers to her long list. This morning my prayer was an image of all of you in church together. Soon, I hope soon. Keeping you all in my thoughts and prayers! Clara is such a strong girl, and is very lucky to have such strong parents, grandparents, and the most Awesome God to protect her. Clara is truly a Miracle! We continue to have her centered in our prayers. She is so blessed to have a family who loves her so much. She entered the world in the right place at the right time. Clara is and Angel with invisible wings and she was sent from above. Keep singing to the heavens and one day Clara Mae will sing too!!!!!!!! Praying for you and your sweet girl! We believe in Miracles and a Faithful God!